A product's probability of failure is equal to the probability that the stress experienced by that product will exceed its strength. In other words, given one probability distribution function for a product's stress and another for its strength, the probability of failure can be estimated by calculating the area of the overlap between the two distributions (i.e., stress-strength analysis). This overlapping region (shown next) may be also referred to as stress-stress interference. However, there will usually be some uncertainty in the estimated parameters for these distributions, which entails uncertainty in the estimated reliability. This article will discuss how reliability can be estimated using stress-strength analysis and how confidence bounds on the reliability can be calculated. The effect of sample size on the confidence bounds will also be illustrated. Clearly, the product is more reliable when the interference region is smaller. Therefore, there are two ways to increase reliability: (i) increase the difference between the mean stress and strength values, which will make the two pdfs move away from each other, or (ii) decrease the standard deviations of the distributions, which will make the distributions narrower. Ideally, the estimates of all stresses and all strengths for each element of a product would be perfectly accurate, but in general this is too costly and resource-intensive to accomplish. For example, we could estimate the stress distribution from customer usage data (e.g., the mileage per year of a passenger car). However, the stress conditions depend on the way the product is used, and these vary greatly based on the customer profiles and environmental conditions. For example, not every vehicle is driven the same miles per year under the same environmental conditions and personal preferences. In addition, the strength distribution mainly depends on the material used in the product, its dimensions and the manufacturing process. All these sources of variation can introduce uncertainty in the estimated reliability. 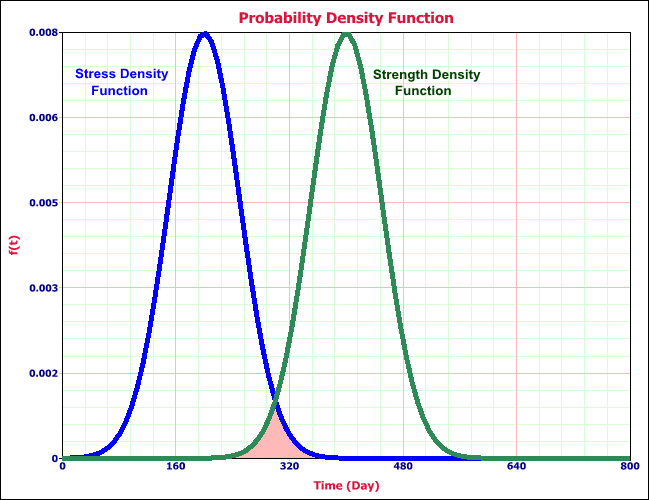 We have explained briefly how to obtain the stress and strength distributions and some of the factors affecting them. An accurate estimation of the probability of failure mainly depends on the sources of the distributions. 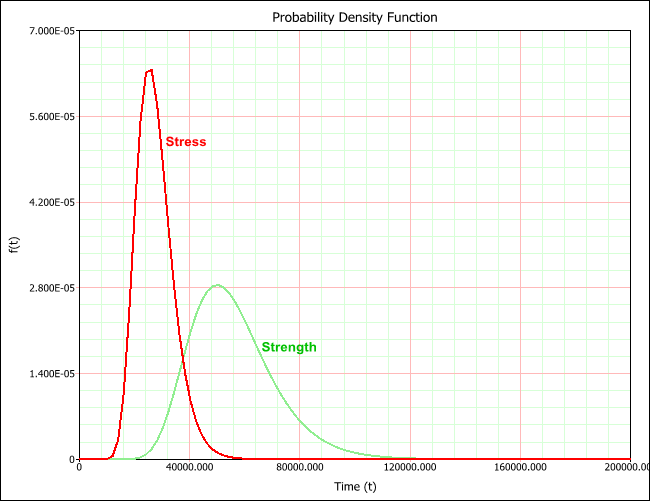 The more accurately we can define the stress and strength distributions, the more accurate the estimated probability value will be. Based on the source of the distribution, which could be based on actual user data or specified by engineers based on engineering knowledge or existing references, there are two types of variation associated with the calculated probability: variation in the model parameters and variation in the probability values. We will focus on variation in the model parameters in this article and show how to calculate the confidence intervals with a simple example in Weibull++ using stress-strength analysis. If the upper bound (U) and lower bound (L) are not infinite (∞) and zero, respectively, then the calculated variance of R is adjusted using [1/F1(U) - F1(L))]2. 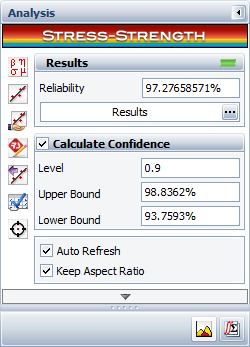 We will use stress-strength analysis in this example to estimate the reliability of a component used in a printer. The stress is the distribution of the number of pages printed by users, and the strength is the distribution of the number of pages printed before the component failed during in-house testing. The warranty for the printer is one year, and the goal is to estimate the reliability of the component within that period, assess the confidence bounds on the reliability and investigate the effect of sample size on confidence bounds. The numbers of pages printed per year from twenty different users are sorted and shown next. This information represents stress because it describes how much "work" the component will perform in a given year. The numbers of pages printed before a failure occurred (for twenty printers) during in-house testing are sorted and shown next (strength data). We will estimate the stress and strength distributions using the data presented in the above tables. Each data set will be analyzed in a Weibull++ standard folio using the lognormal distribution and MLE analysis method. As shown next, the parameters of the stress distribution are estimated to be log-mean = 10.196956 and log-std = 0.238039. The parameters of the strength distribution are estimated to be log-mean = 10.892812 and log-std = 0.270042. 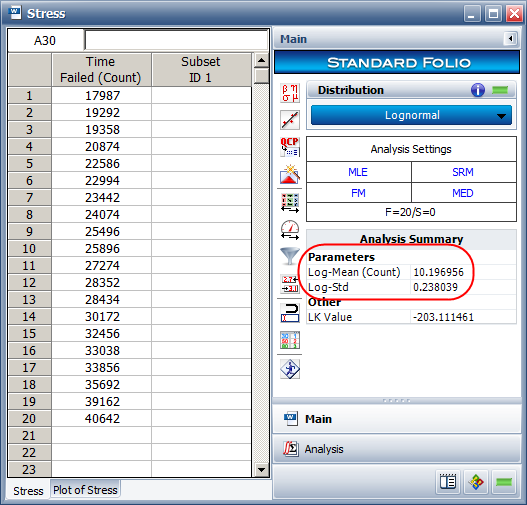 Now we can compare the two data sheets using the stress-strength folio. The pdfs of the two data sets are shown next. The estimated reliability for the printer is 97.34%. The associated confidence bounds are estimated to be 99.22% for the upper bound and 91.33% for the lower bound (with a 90% confidence level). However, with larger samples for the stress and strength data, the width of the bounds can be narrowed. Therefore, with larger samples, we can be more certain about the reliability of the product, which can translate into more accurate estimations for customer returns during the printer's warranty period. Let's assume that the collected user data and the in-house testing data are doubled. The extended data sets are shown below. We will analyze each data set using the same analysis settings. The parameters of the stress distribution in this case are estimated to be log-mean = 10.244621 and log-std = 0.239873. The parameters of the strength distribution are estimated to be log-mean = 10.940471 and log-std = 0.270892. Now we can compare the two extended data sets using the stress-strength folio. As you can see in the results shown next, the estimated reliability for the printer, 97.28%, did not change significantly. On the other hand, the associated confidence bounds are narrowed down to 98.84% for the upper bound and 93.76% for the lower bound (with the same 90% confidence level), which represents a more precise reliability estimation. In this article, we presented the theory and mathematical formulations behind stress-strength analysis and confidence bounds calculations with a basic example. The example illustrates that increasing the amount of data collected during testing can lead to a more precise estimate of product reliability via stress-strength analysis. li. Utkin, L.V., Kozine, I.O., Stress-Strength Reliability Models Under Incomplete Information.